People who know enough about the internet will generally know that BitTorrent are amongst the high-profile names that are stuck with a reputation for something no matter how hard they try otherwise, although being known as a hub of TV piracy is not stopping them from making the efforts to change public perception at least a little, after revealing their intention to produce their own TV series. While a huge majority of content shared on the website will be copies of popular TV shows, films, or music, BitTorrent, who have previously expressed their distaste at the label that follows their every move, will hope to at least make a dent in that reputation for piracy by allowing their 170 million users to watch and decide on upcoming pilot Fly or Die. The ironically-named show is noted as being part of a ‘BitTorrent Bundle’ (a new source for the service’s ‘legitimate’ online content), and after the pilot will leave it to viewers to vote on whether or not it becomes a full series. They will hope that Fly or Die has enough quality to achieve that status, with the format set to be produced by music production company Rock Mafia (consisting of Antonia Armato and Tim James, noted as having worked on the videos of some of the biggest current names in the music industry), and a format that promises to ‘take the viewer inside the glamour and grim realities of the music industry’, under a plot that ‘blurs the lines between truth and fiction’. 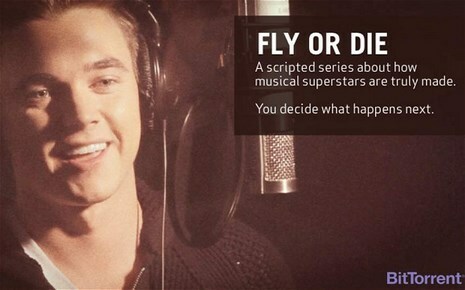 The ‘bundle’ offering of the show will be made available to BitTorrent users as a free download off the website, with the added option of subscribing to Fly or Die by giving their email address to BitTorrent, a move which in return will give them ‘access the show’s trailer’ and ‘information on the characters and music’, as well as an invitation to have direct involvement when it comes to ‘shaping Fly or Die‘s future’, namely, the fan voting feature. Looking to promote the show through their file sharing nature, will BitTorrent’s efforts at producing legal content pay off when it comes to changing perceptions, or will this just be one drop of saving grace in the eyes of larger broadcasters?